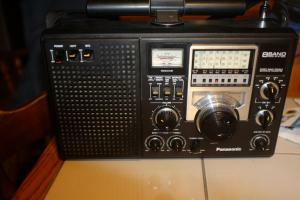 The Panasonic RF-2200 receives the AM, FM and shortwave bands. Ranges: .525-16.1, 3.9-8, 8-12, 12-16, 20-24 and 24-28 MHz plus FM. This radio features a very accurate analog dial. It operates from 120 VAC or from four D cells. It has an S-Meter, BFO, FM AFC, Bass, Treble, Record Jack, Two Tuning Rates, Dial Lamp, Dial Lamp Switch, RF Gain, Calibrator 125/500 kHz and External Antenna Terminals. This dual conversion circuit features wide and narrow selectivity (5/3.4 kHz -6dB). The rotatable ferrite rod antenna makes the RF2200 a strong medium wave performer. This radio has been realigned by a professional rf engineer and is in very good condition, There is some very minor scratches that are very smaall and hardly noticable. Includes original power cord and a copy of the owners manual.$300.00 Buyer pays shipping. Paypal or postal money order only.One of the best portables ever produced. No Refunds due to switching of parts.Please look up my reviews, I am a honest seller.